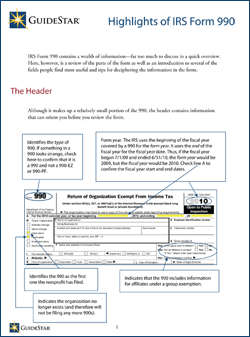 Let’s face it: the IRS Form 990 can be confusing. It’s also the most valuable source of information when it comes to digging into a nonprofit. It’s provides information on the filing organization’s mission, programs, and finances. Forms 990 are our bread and butter at GuideStar. We get questions all the time about the various fields of information, so we thought we’d put together an illustrated guide that walks you through the form. We hope it gets to the heart of your questions, but if you have more, let us know in the comments! Fantastic info! I always hated filling out 990s, but they are awesome tools for information gathering.